He was legendary captain of Celtic FC and receives the One Club Man. He also joins the award-winning Malin Mostrom, one of the great references of women's football in Sweden. El Athletic set up an award in 2015 that is gaining weight and much fans enthusiasm. This is the One Club Man, which distinguishes players who have developed their entire career in the same team, something that Bilbao has aspired to with its lions throughout its centennial history. On this occasion the One Club Woman is incorporated, so as not to miss women. Le Tissier premiered the catwalk in these awards, in 2015, being a mythical player in English Southampton for 17 seasons. They followed Maldini, saint of Milan, the German goal Maier (Bayern Munich) and a Puyol that covered 15 seasons in the Barça. This time it has been repaired in the figure of William McNeill, legendary captain of Celtic FC. The Scottish defender is the player who has played most matches with the famous blanquiverde shirt, the only one he wore throughout his career, a total of 822 for 18 seasons. 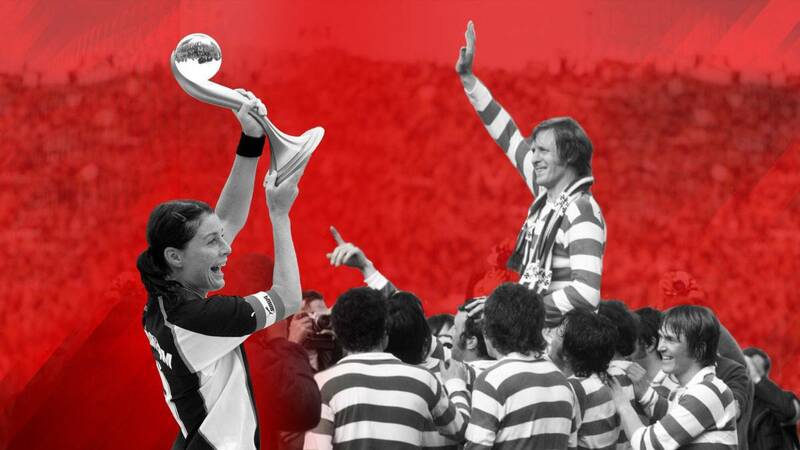 "The choice of Billy McNeill as OCM transcends the extraordinary individual trajectory of the player and links directly with the team he captained, the ones known as 'Lisbon Lions'," said Ibaigane, "that memorable Celtic conquered the Cup of Europe in 1967 against Inter Milan by Helenio Herrera (2-1) with an eleven composed entirely by Scottish footballers, all born within a radius of less than 50 kilometers around Glasgow. 4 he suffers from dementia and goes through a delicate state of health, which will prevent him from receiving the award in San Mamés personally, as has happened with previous winners.He led Celtic during his most glorious time in the 60s and 70s, winning consecutively 9 league championships and other 13 Scottish tournaments, although that team will always be remembered for one of the greatest feats in the history of football ol, that European Cup of 1967, being, in addition, the first British team that conquered it. He was also international 29 times with Scotland. Once retired as a footballer, the legend of Celtic led the team for 9 seasons, from 1978 to 1983 and from 1987 to 1991, winning four Scottish leagues and the double in the 1987-88 season in which the centenary of the club was fulfilled. He also coached Clyde, Aberdeen, Manchester City and Aston Villa. From 2009, McNeill became the best possible ambassador for Celtic, the way and way that Iribar is Athletic. In 2015, after more than 60 years dedicated to the club between player, coach and ambassador, Celtic decided to dedicate a statue of recognition next to his stadium, which shows Billy McNeill lifting the European Cup with the unmistakable striped shirt horizontal green and white. On the other hand, the exjgadora Malin Mostrom is one of the great references of Swedish women's football in recent years. The 12 seasons he was at the Umeå IK since his debut in 1995 until he hung up his boots at the end of 2006 have made him an icon for the club where he played his entire professional career. The track record that was worked on both individual recognitions and collective triumphs speaks for itself. From her position in midfield, Malin Moström was one of the keys to explaining Umeå IK's dominance in Swedish and European women's football mainly in the first decade of the 21st century. The same could be applied to the good time that the Scandinavian team lived in that period. With the Umea IK, Moström was scored on 6 occasions the Damallsvenskan League and other 4 the Swedish Cup. Although, without doubt, the greatest achievements he won them in 2003 and 2004, winning the Champions League against the Danish Fortuna Hjorring and the Germans of the FFC Frankfurt. It was 113 times international with a Swedish team, which was runner-up in the world in 2003 after losing the final with the United States and where she was chosen in the best eleven of the World Cup. She also became runner-up in Europe in 2001 after losing to Germany and fourth in the 2004 Athens Olympics. Chosen female footballer of the year in Sweden in 2001 and best midfielder in 2003, 2004 and 2005, Umeå IK retired as a tribute her shirt number 6 when Malin announced that he was hanging his boots. Interestingly, he would re-dress her a few months later when in June 2007 he reappeared with a contract of a couple of weeks to lend a hand to his lifelong team and cover the injuries of his teammates Frisk and Ljunberg.